Online payroll software to keep you compliant with CRA payroll regulations and help you pay your employees and independent contractors easily. Payroll is mission-critical to your business. We get that, big time. At my former business, we used one of the large international online payroll companies. We would continuously be frustrated by how cumbersome the... the program was, how many different things they would charge us a fee for and the lack of personalized customer service. Upon starting my next company, I sought out a better solution. I've been very happy with my decision to go with Wagepoint. It offers a much easier to use interface, the staff are exceedingly helpful and the cost is much lower. 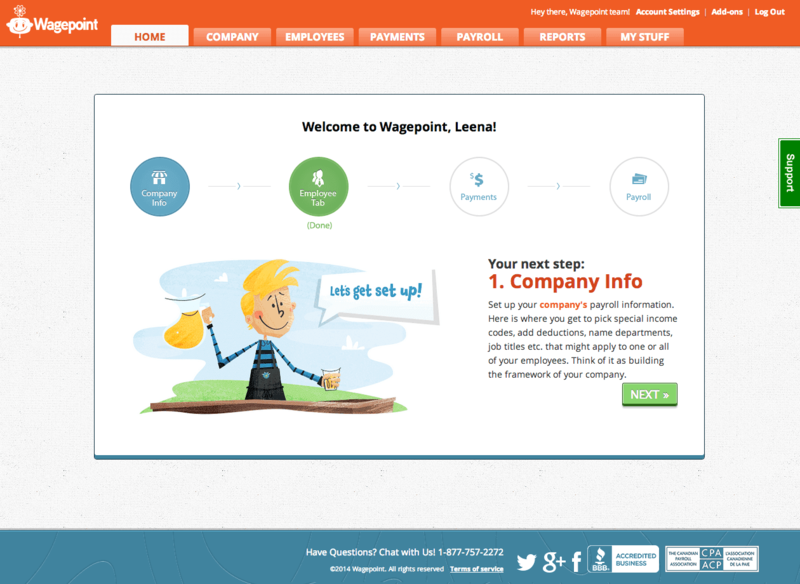 I'd recommend Wagepoint's payroll services to businesses of any size! the program was, how many different things they would charge us a fee for and the lack of personalized customer service. Upon starting my next company, I sought out a better solution. I've been very happy with my decision to go with Wagepoint. It offers a much easier to use interface, the staff are exceedingly helpful and the cost is much lower. 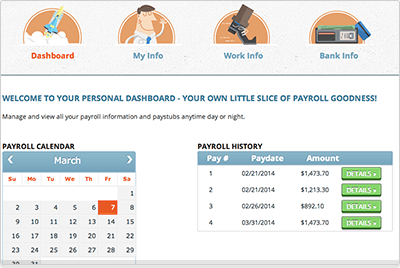 I'd recommend Wagepoint's payroll services to businesses of any size! 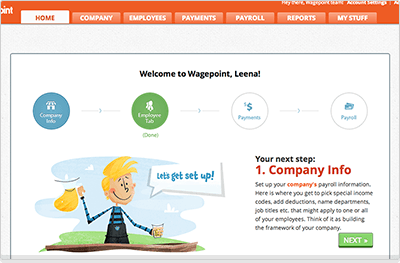 Wagepoint has simplified the payroll function of our company with great ease. They are friendly, helpful and always accessible. We switched from a major payroll provider to Wagepoint and we’re never going back! 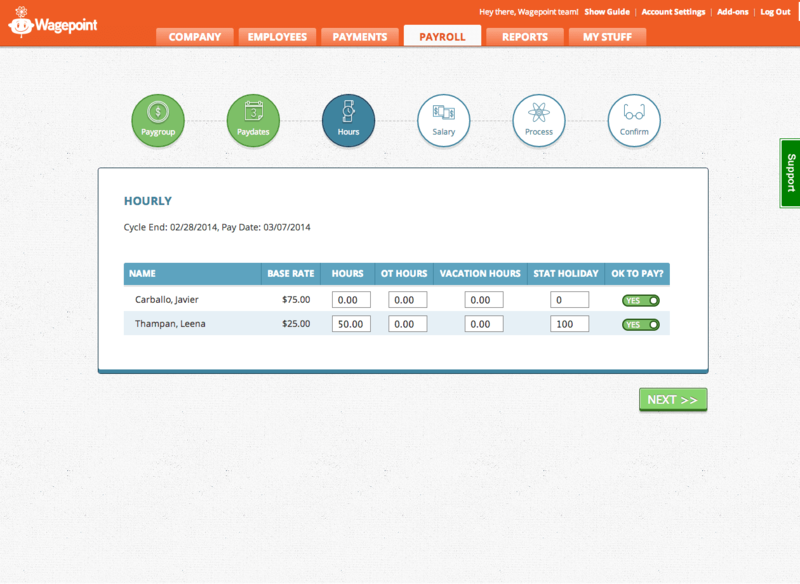 Wagepoint is so automated and their team is so incredibly helpful... that I hardly had to do any work to switch over. It couldn't be more of a night-and-day experience from my previous provider. that I hardly had to do any work to switch over. It couldn't be more of a night-and-day experience from my previous provider. You never have to worry about the basics with our online payroll software. What do you call payroll software that doesn't do all the stuff below? Well, we wouldn't know because we do it all! Payroll done without any drama. 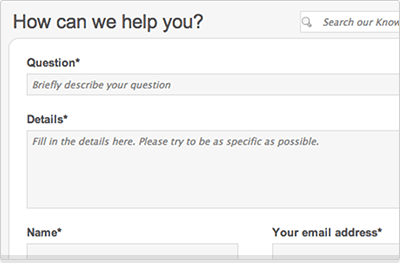 We work hard to craft an amazing, user-friendly experience that passes the 'my-grandma-could-use-it' sniff test. Step into a land where setting up your company might actually be tolerable, if not somewhat fun. Tired of re-printing lost pay stubs and year-end T4s? Once you provide your employees access to their own personal information, you will never have to worry about that ever again. 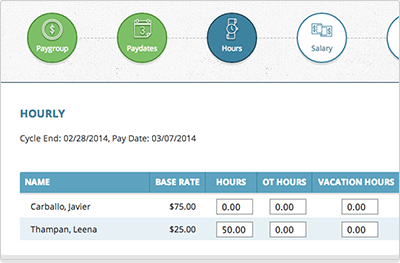 Use Wagepoint to pay hourly or salaried employees or even contractors at the same time. You can also add multiple Paygroups for payrolls on different frequencies. If your payroll doesn't change much and could run itself — let it. 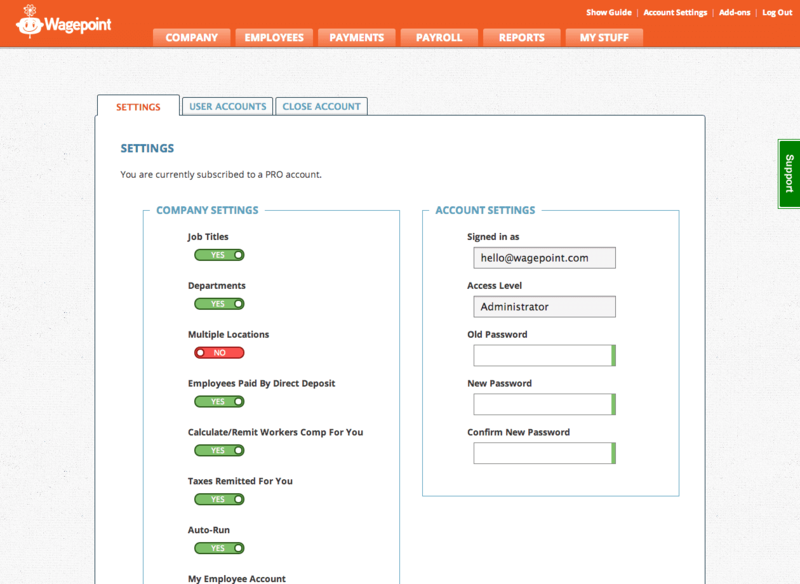 Our set-it-and-forget-it features mean that your payroll will run even when you're sipping mai tais on the beach. 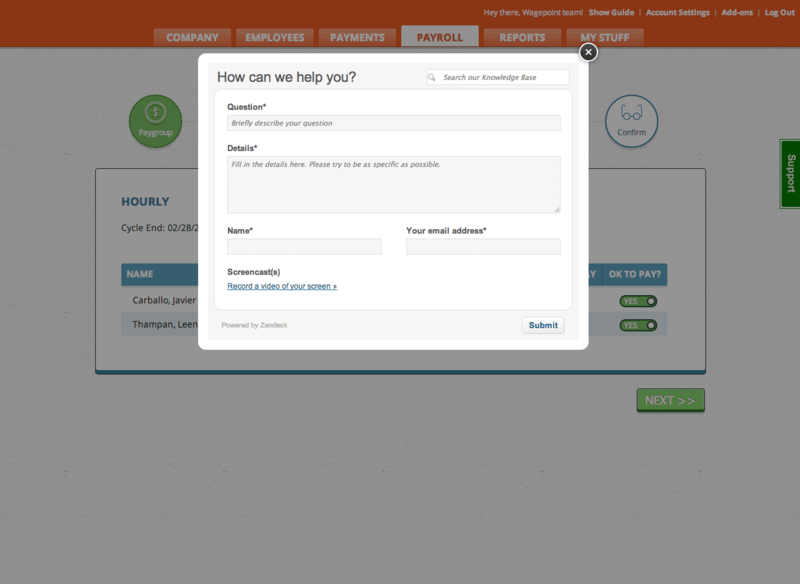 Use the floating 'Support' tab to access our knowledge base or fire off a support ticket in case of questions. No setup fees, no year-end fees and definitely no contracts. 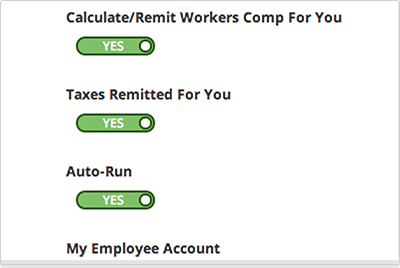 The example above shows how starting prices are calculated for semi-monthly or bi-weekly payroll cycles using a $20 base fee. Weekly frequency has a $10 base fee and quarterly payroll has a $75 base fee. To determine your costs based on your needs, contact us. Security is important to us. Our servers are hosted in the Amazon cloud to support our international expansion while providing our customers with greater security, reliability and functionality. We provide 256-bit SSL encryption on your connection to the Wagepoint site. This means the data you send and receive is guarded from prying eyes. And we will never share your information with anyone without your permission. You have our word on that! 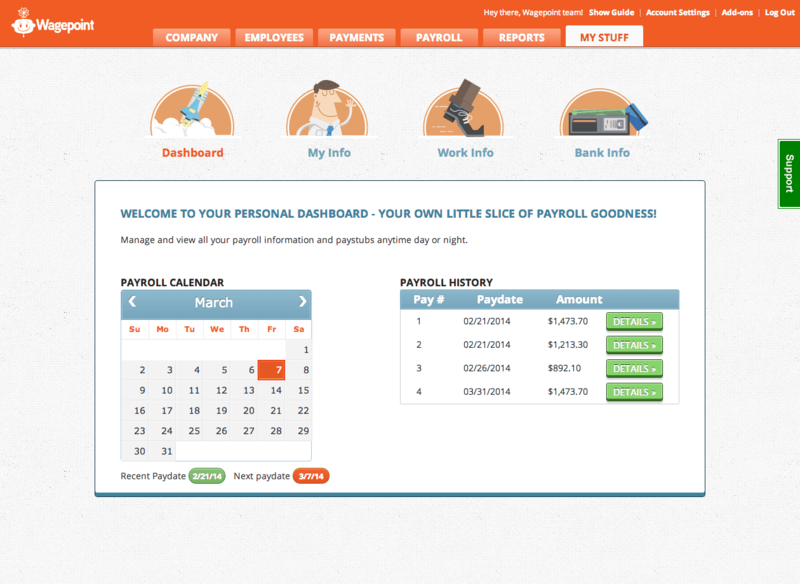 We designed our payroll system to be easy to use and to love. You’ll also be extremely fond of our top-notch customer support team.